- Measures: Width: 300 cm Depth: 108 cm Height: 203 cm Weight: 2125 kg - 2 year Guarantee! - Free Shipping! The oven can be on the left side or on the right side of the Barbecue and the sink can also be changed. The price keeps the same! 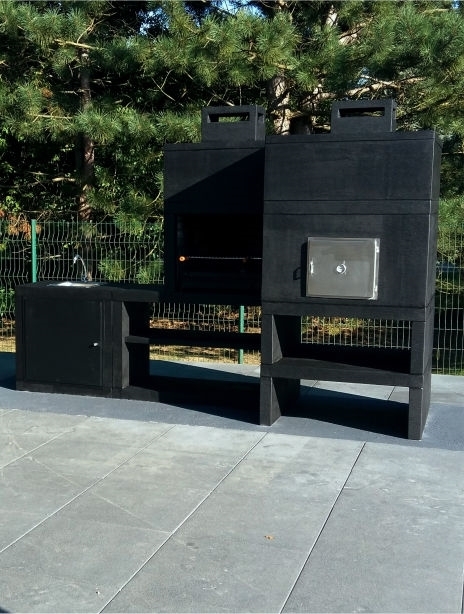 Cast Stone Barbecue With Wood Fired Oven AV280F. Free shipping to England, metropolitan France*, Monaco, Belgium, Luxembourg, Italy and Spain. For other destinations please contact us. These festive wheels of steak, Boursin cheese, spinach and sun-dried tomatoes look fancy, but they’re quite easy to make. For a party, arrange them on a platter atop a bed of spinach. 2. Place sun-dried tomatoes in a bowl; pour boiling water over them and let steep until softened, about 10 minutes. Drain and chop. 3. Meanwhile, place steak between 2 large pieces of plastic wrap. Pound each side of the steak thoroughly with the pointed side of a meat mallet until the steak is an even ¼ -inch thickness. 4. Rub garlic all over one side of the steak. Spread cheese lengthwise in a 3-inch-wide strip down the middle of the steak. Top with the sun-dried tomatoes and spinach. Starting at one edge of a long side, roll the steak up tightly, tucking in the filling as you go. 5.Carefully rub salt and pepper all over the outside of the steak roll. Turn the roll so the overlapping edge is on top. Push 8 skewers, evenly spaced, through the roll, close to the overlapping edge to hold the roll together. Slice the roll into 8 equal portions, roughly 1 to 1 ½ inches thick, with a skewer in each. Lay the slices on their sides and push the skewer through so it sticks out about 1 inch. 6.Oil the grill rack. Grill the pinwheels 3 to 4 minutes per side for medium-rare. Use a spatula when turning them to prevent too much filling from falling out. (Don’t worry if the ends of the skewers burn. They will still hold the pinwheels together.) Remove the skewers; let the pinwheels rest for 5 minutes before serving.